There's nothing better than a drive to the country for city slickers needing to unwind and take time to 'smell the roses'. Once you hit the freeway you feel the freedom of the open road and the stress of the work week soon dissipates. For me, I also break out with that old Willy Nelson song, On the Road Again. It puts a smile on my face as I'm feeling on holiday even when I'm only going on a day trip. 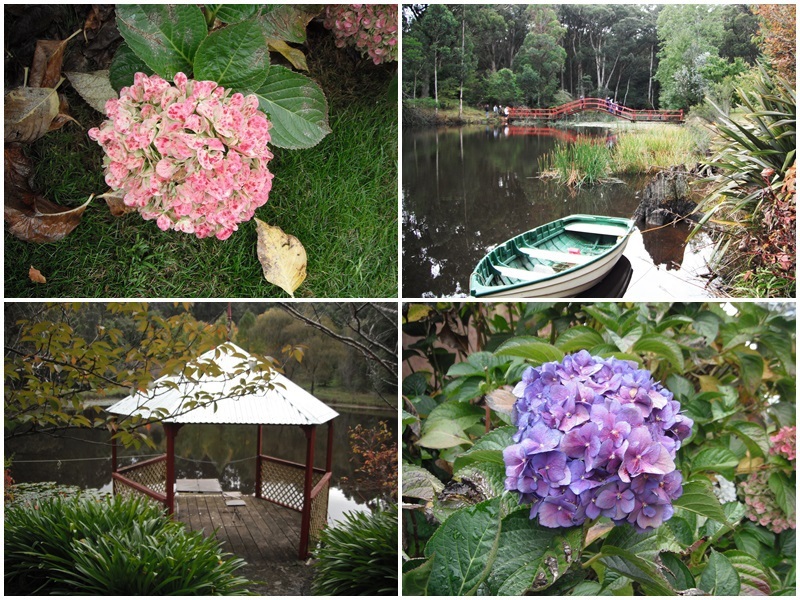 My recent escape took me south of Sydney to the Southern Highlands and the small township of Bundanoon. The autumn open gardens weekend was the main reason for my visit but I found a whole lot more that made my day. 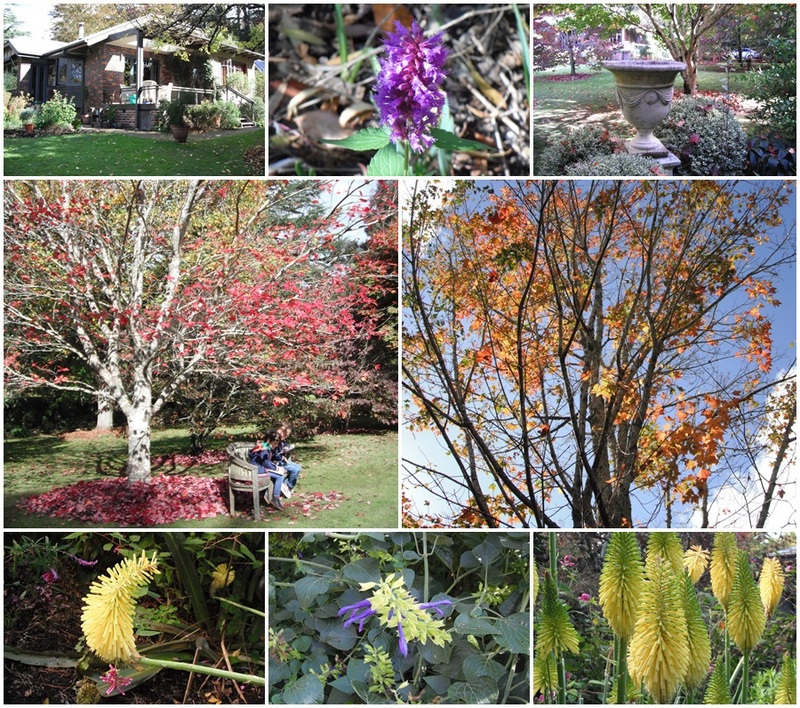 It's a beautiful time of year with the changing of the leaves and my first stop was to private garden, Eastdene. It's a huge garden, 55 hectares to be exact, and it saw me get plenty of exercise. The Japanese maple trees were resplendent in their hues of red and gold whilst a formal garden with ponds and a fountain surrounded by box hedges was equally impressive. The house was huge as well with some interesting sculptures abounding. A walk down to the lake was a photographer's dream with a summer house and a Monet-style bridge awaiting the click of the lens. Picture perfect was this traditional country property. Leaving this oasis, I headed to the village and had a mosey around. A range of shops including antique dealers, cafes and tea houses can be found in the main street but a mural on the side of a wall caught my eye and loving street art I had to park and take a closer look, and more photos. 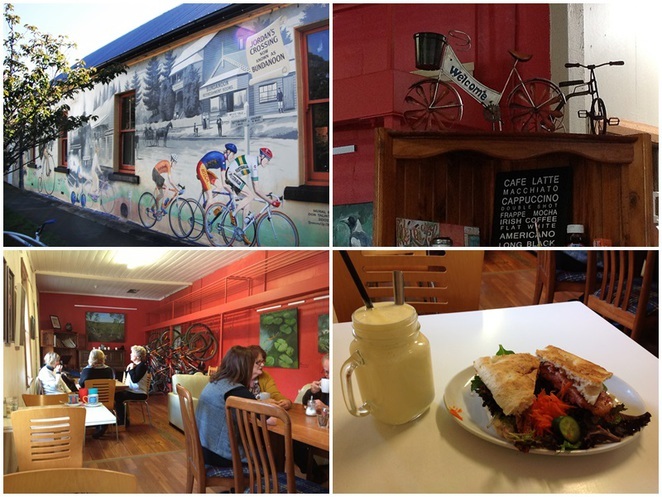 The building turned out to be Ye Olde Bicycle Shoppe, complete with cafe. As it was lunchtime, I strolled into this quirky establishment for a bite to eat. A little gem of a place, I ordered a mango smoothie and a classic BLT on toasted Turkish bread. A generous helping of bacon and some salad, it hit the spot and was just what I needed. Tasty, enjoyable and not too heavy. Quite a unique place to eat, you can get a variety of open sandwiches, gourmet pies, burgers, cakes and slices, malted milkshakes, juices and sports drinks. They cater for vegetarians as well as having gluten and dairy free options. An all day breakfast and high teas are also available. The 150 year old building still hires out bikes and helmets, gives out maps and suggested trails as well as selling spare parts for your own bike – tubes, pumps and repair kits. A mountain bike will cost you $20 for 1 hour whilst a tandem bike comes at $25 hire per hour. They even do baby seat carriers for those with toddlers in tow. But that's not all. They also sell local art works and souvenirs, have toys and games for kids to play with as well as books to read. Just want a coffee and not eating, then relax on one of the comfy lounges. Oh, and they have free wifi for those that want to be connected. Located at 11 Church Street, they're open 7 days from 8.30am. Love this place. With lunch done, I ventured down the side street (Anzac Pde) to turn my car around and came across some other surprises. The first one was a beautiful public space, the Nancy Kingsbury Memorial Park, with a trellis covered in greenery, a stone sculpture, picnic tables and seats and more glorious autumn coloured trees. Further down the road, I came across a beautiful old pinkish building with a sign – The Pill Factory. I was curious and thought it must be a shop of some kind but it turned out to be accommodation. As the name suggests though, it was once a factory that sold pills and powders but became many other things before falling into disrepair. This historic building, now restored, caters to individuals and groups and features a dining room and adjacent sitting room, a private bar and a games room. Across from it is a more modern country motel. Both looked like nice places to set your feet down for a weekend stay. I was loving this place even more. It was then off to my next and last private garden visit, Arden. This property was much smaller at 2 acres with beautiful trees and their fallen ground covers being prolific. Some interesting flowers were blooming but in spring you would see more with lots of bulbs present, magnolias and a wide variety of plants prospering on the volcanic soil. Chooks, ducks and a vegie garden are also present. It was time to say goodbye to this beautiful town but if I had more time then I would visit some of the wineries in the area and the sandstone grotto of Glow Worm Glen to the east of town. Bundanoon is also the northern gateway to Morton National Park, which is great for bushwalking and admiring the plunging waterfalls. Then there are regular events taking place, such as CamelBak Highland Fling (a mountain biking event in November) and the Bundanoon Highland Gathering (a festival on in early April celebrating all things Scottish). Lots of reasons to return. 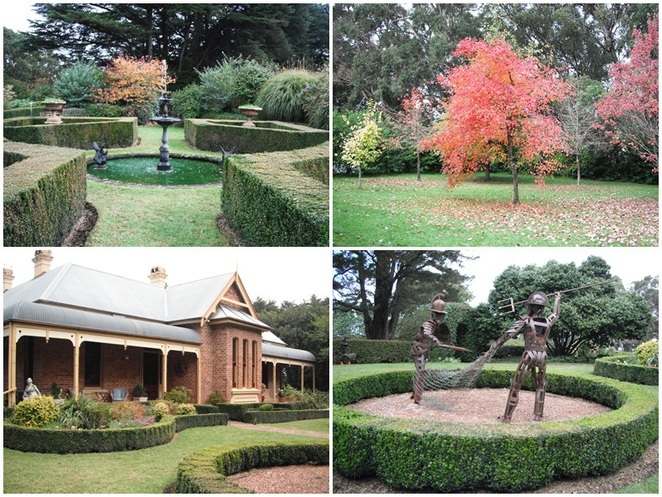 Travelling back via a scenic route saw me pass through even smaller places like Exeter and Sutton Forest before reaching Moss Vale, Bowral and Mittagong. Since the Hume Highway bypass of these towns occurred, I haven't ventured down this path often and had forgotten how amazing this area is. With Bundanoon being the furthest south of these towns, it's still only 1hour and 40minutes from Sydney. Day trips to the country don't happen often enough for me and when they do they are invigorating, refreshing and leave me feeling like I'm ready to conquer the world again. Note to self - get out and explore more. Congratulations on your success in the competition. I love this article. Will want to explore more too!